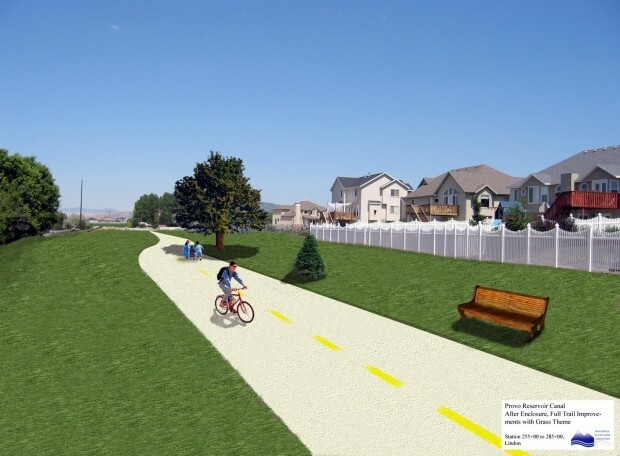 Best of all, the new 16-mile trail will connect with our beloved Provo River Parkway Trail, making it easy for Provo cyclists to go all the way to the point of the mountain on a paved, car-free trail. The new trail is a part of the ongoing Provo Reservoir Canal Enclosure Project and cylists an expect to see trail construction begin this spring. It may sound cheesy, but my beagle and I jumped around the house in celebration and treated ourselves to icecream / a rawhide bone when we read about this project. This is going to be HUGE for our area and the surrounding cities. Oh happy day! This entry was posted in Bike Paths, Bikes in the News, Provo Bicycle Projects and tagged Provo Reservoir Canal Enclosure Project by Jamie. Bookmark the permalink. Is this going to connect the Jordan River path and the Provo/Orem segments together?? That would be great to finally get on the riding path in Lehi at the point and ride all the way to provo on it!! Or is this unrelated, and if it is why waste the moeny on a new route when there is one just waiting to be paved? I believe this path will connect in with the Provo River trail. And yes it is going to be great to get this type of connectivity.